The Leclare Platinum Upgrade: LED lighting, high-efficiency plumbing fixtures and Energy Star GE appliances are not only budget-friendly, they are eco-friendly too. 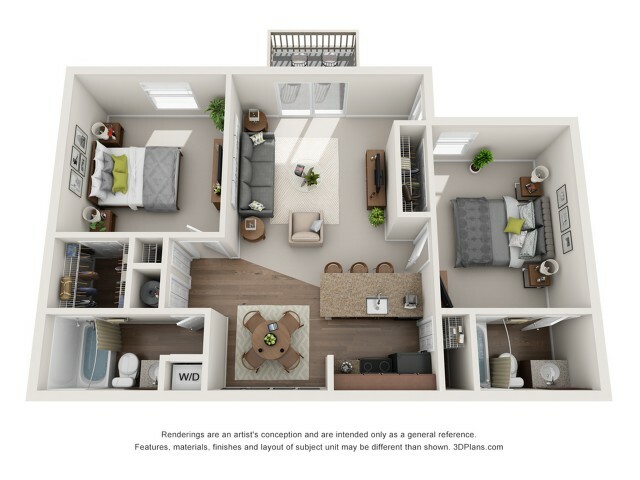 The Platinum apartment homes include Classic finishes with upgrades like granite countertops, brushed nickel hardware, undermount sinks, mosaic backsplash, espresso shaker style cabinetry and faux-wood plank flooring . *Note All leases executed for shorter than a twelve (12) month agreement are subject to a $50 per month, short-term fee for the duration of the lease agreement. * Pricing and availability are subject to change. In addition to quoted rent, residents are required to pay an additional monthly fee of $124.00 ($89.00 for cable/internet and $35.00 for valet trash services). **Square footage listed is an approximate value for each unit. All leases executed for shorter than a twelve (12) month agreement are subject to a $50 per month, short-term fee for the duration of the lease agreement. Trellis at the Lakes is a pet friendly community! The following fees apply to pets who reside at the community: $300 fee for one dog, $450 fee for two dogs, $20/mo per dog for pet rent, $100 fee for one cat, $200 fee for two cats, No pet rent for cats. Two pets maximum per apartment. Breed restrictions do apply, see office associate for additional information. No exotic pets permitted.